An impressive example of such a medium can be found at the synagogue in Bad Kreuznach, which formerly served as a chapel for the American armed forces and was used by all kinds of religious communities. Since 2002, the synagogue has provided a long-sought home to the Jewish community around Bad Kreuznach and Birkenfeld. 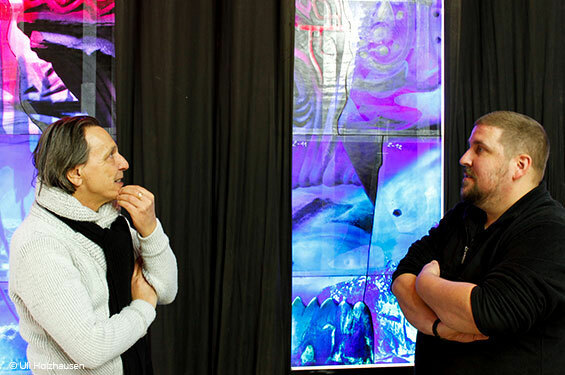 Thanks to the cooperation of Derix Glasstudios and the artist René Blättermann and the artistic design of the large triptych windows above the portal, the Bad Kreuznach synagogue will now appear in a new light. 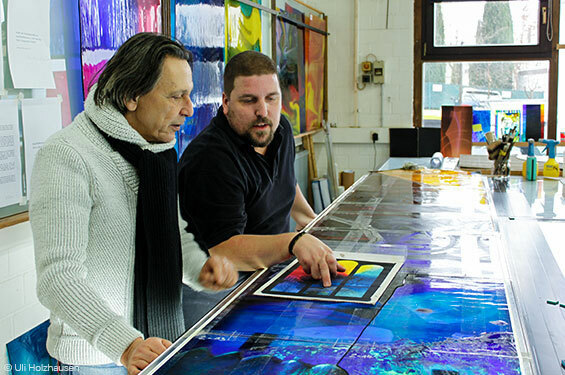 René Blättermann, greatly influenced by his family history, deals intensively with the history of the Jewish people and stages it artistically in his works. In doing so, his artworks serve as media, in which multilayered stories are secreted, from which each level is shaped individually and then joined together to become a complete composition. 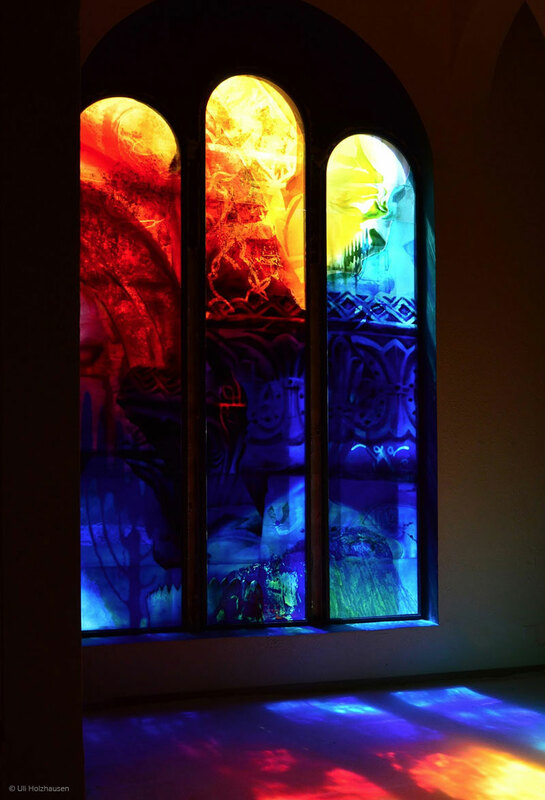 René Blättermann was also able to demonstrate this skillful combination of art and history with his glass artwork Simchat Torah (Hebrew for “joy of the Torah”) in the synagogue at Bad Kreuznach. 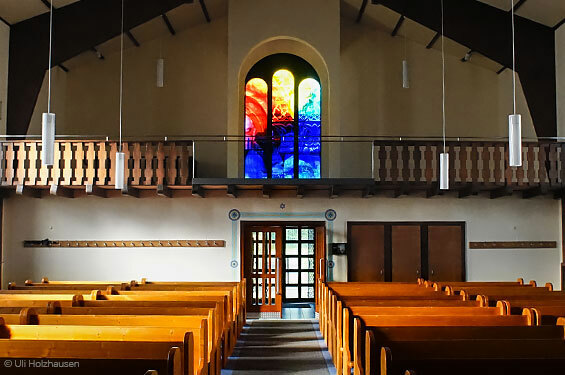 The 2.6-meter wide and 3.4-meter high classic triptych window made of genuine hand-blown antique glass reflects central aspects and themes of Jewish culture and religion with its impressive imagery. Based on the profound symbolism of the number seven in the Torah, the artist has deliberately chosen seven levels of meaning in composing his work. Each of these levels contains a specific symbol, which has an individual connection to the Jewish rite and Jewish history. For example, the artist cites elements such as a stone relief of the temple in Jerusalem, a stone frieze from the synagogue in Worms and an ornament of the Torah curtain from the original Kreuznach synagogue and combines them creatively as a temple motif. In addition to this symbol, other images such as the menorah can be found as representations of life, of change and growth or Mount Sinai as a place of God’s revelation and the handing down of the Torah. 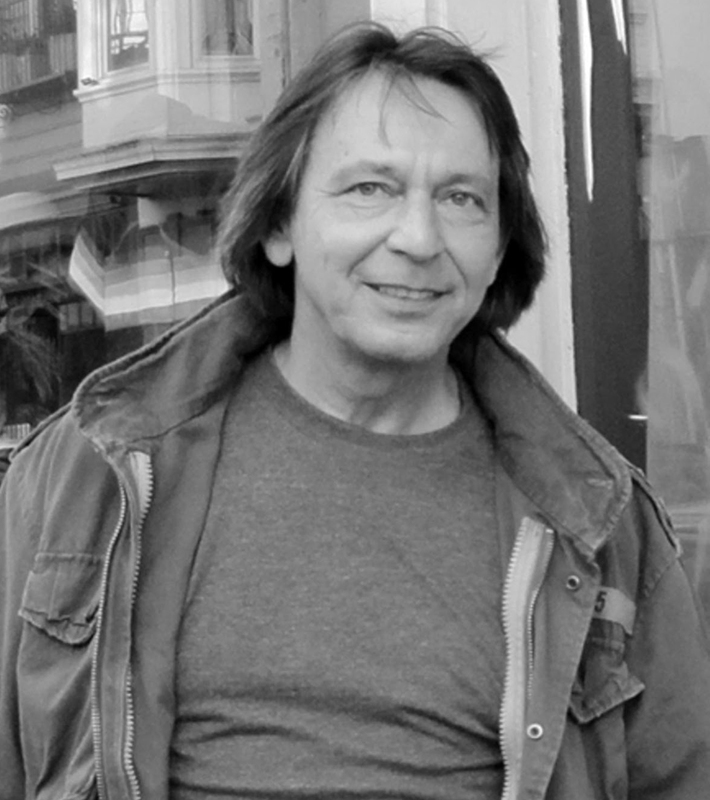 Overall, René Blättermann’s artwork goes full circle from wandering in the desert to the handing down of the Tora; he honors the temple and the synagogue with its annual cycle of reading and the joy of being guided, bears witness to the creed and combines the memory of oppression and flight with the power of reconciliation. This intentional level is also highlighted by the coloring of the artwork. This is because the wonderful color blends and pictorial overlays have by no means been chosen at random but are based on the differently colored stones on the breastplate of a high priest, which correspond to the 12 tribes of Israel. 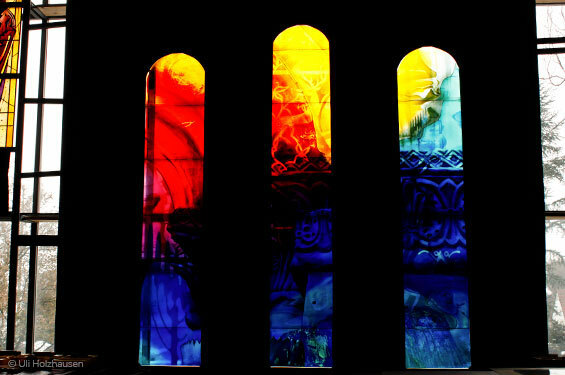 Anyone who wishes to see for himself not only the visually impressive interplay of glass art and Jewish history but would also like to find out more about the motivation of the narrative behind the artwork, is cordially invited to take part in one of the guided tours provided at the synagogue. 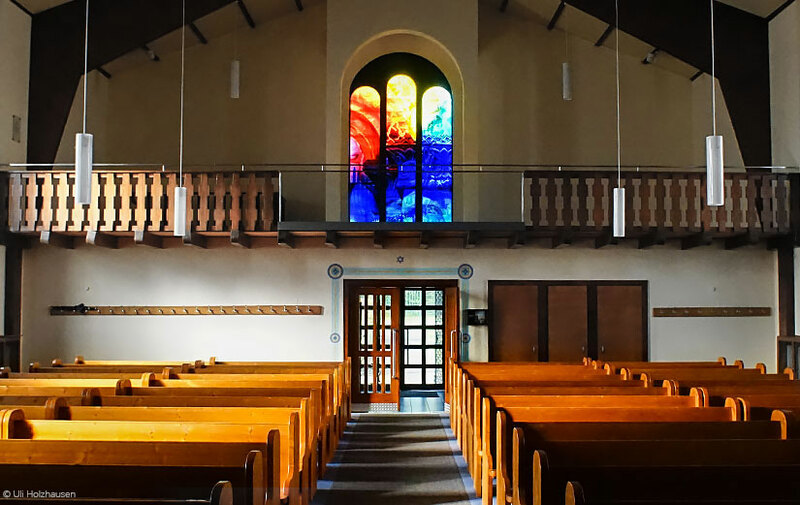 In addition to an expert explanation of the glass artwork, these also offer further interesting insights into the history of Bad Kreuznach’s Jewish community and the role of the synagogue.